The Clubs and Events Board spent much of its Tuesday meeting preparing for Thursday’s first club day of the semester. 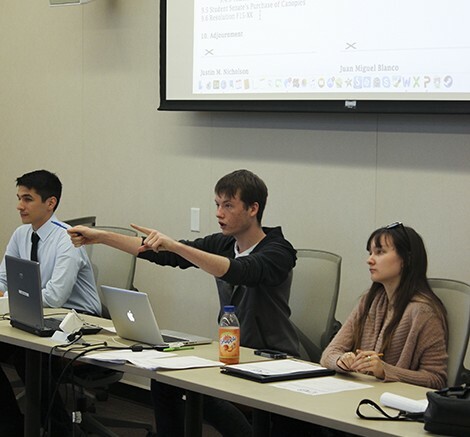 In a busy day for the Associated Student Body (ASB), the Clubs and Events Board (CAEB) meeting followed directly after Student Senate on Tuesday. The “Let the games begin” club day will start at 10 a.m. and will consist of live music, life-sized games like tetris and pacman and a club “board game” competition. The events end at 1 p.m. Sergeant Mike Olson of the Los Rios Police Department came to the meeting to reiterate what he said in last week’s Student Senate meeting about safety concerns. Several clubs, including the Puente Club, which was attending the meeting for the first time this year, had updates on activities that were coming up in the next few weeks. The Fashion Club will be meeting in the Art and Science building room 105 every Monday at 3:30 p.m. Math Club will be meeting in the Student Center by the eServices Center every Monday at 11 a.m. there will be pizza. The Puente Club will be holding an event on Latino Heritage Day, Oct. 8, from 10 a.m. – 2 p.m. in the quad. Be the first to comment on "CAEB puts finishing touches on club day"